Collection Information Bookings are essential, please call 1300 228 546 in advanced. Experience one of the world’s great coastal drives on a full day tour. The Great Ocean Road stretches for 243 kilometres along the stunning southeastern coast between Torquay and Warrnambool. 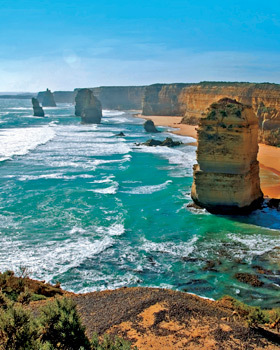 See the rugged splendour of the Twelve Apostles. These incredible 45 metre-high limestone rock formations are the result of erosion that began up to 20 million years ago. Your guide will share the history of their fascinating evolution while you take in the great spectacle of this natural wonder. If you find you can only count 9 Apostles and not 12 – test your driver guide’s knowledge as to why! This full day tour commences in Melbourne with a complimentary hotel pick up at selected hotels and includes all the major highlights and sites along the Great Ocean Road.